Audi will be the first automaker to bring the fast LTE data transfer and the 2014 S3 Sportback will be the first car in the world to receive it. What will this mean for drivers and passengers? The new 2014 Audi S3 Sportback will be the first car in the world to receive the fast LTE data transfer with full integration. Audi has announced LTE can be ordered as an option in the new S3 Sportback starting this month and in all other model variants from early November. What will this new high-speed data technology mean for drivers and passengers? Audi will integrate the new LTE technology with their Audi connect which will network the new S3 Sportback with the driver, the Internet and the environment. LTE (Long Term Evolution) standard takes mobile Internet to a whole new level in the premium compact. The high-speed data transfer technology will enable the exchange of large amounts of data via the Internet, such as music and films in HD quality. Drivers will insert a suitable SIM card into a slot in the MMI navigation plus unit in the Audi S3 Sportback to activate the LTE network. These commercial networks exist all over the U.S. and in many countries in Europe already. The standard is expected to be available around the globe by the end of 2014. 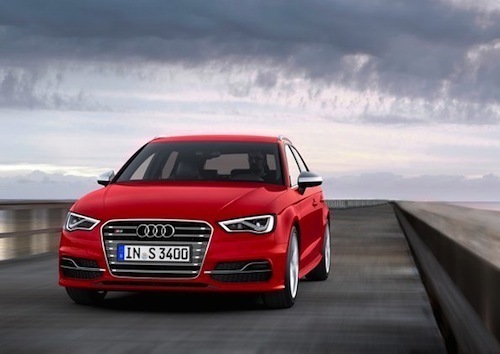 Passengers who are riding in the S3 Sportback will be able to connect their mobile devices to the WLAN hotspot integrated into the car, and can surf the web independently of one another. How will this affect the driver when one passenger is participating in a video conference while another watches a video? It could make for an interesting ride as the driver is bombarded with sensory overload. It will be hard to keep their attention on the road and not on everything going on in the car. The driver will also be connected via the tailored services provided by Audi connect. The MMI navigation plus uses LTE to connect the driver using everything from the navigation system with Google Earth and Google Street View to Audi music stream web radio and online traffic information. And the new high-speed data technology will keep drivers and passengers connected to social media in a big way. Facebook and Twitter will be able to be accessed in the new S3 Sportback as drivers can use a “text-to-speech” function and a text function with prepared text modules. Audi will feature over a dozen Audi connect services that will include a text-to-speech function for e-mail and a dictation function for text messages (SMS). And this is just the beginning as this technology advances and the range of services is already expanding rapidly. Audi says this new LTE technology will make their new 2014 S3 Sportback “more of an experiential space.” And look for Audi to be a driving force behind the networking with other automobiles and the transport infrastructure (car-to-X-communication). Whether we are ready or not, the new Audi S3 Sportback is taking this high-speed data technology in the automobile to a new dimension.